Jenn starting off the session. 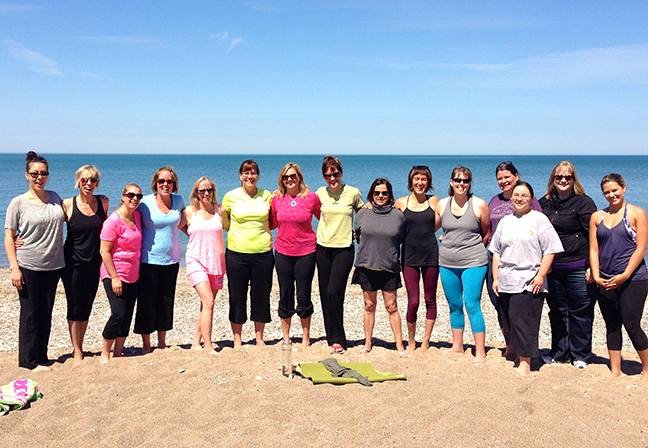 by Diva Calista Powell This past month Bayfield hosted their annual Girl’s Getaway Weekend and I was lucky enough to participate in a yoga session with a beautiful backdrop of Lake Huron. Hosted by Kirsten Harrett, owner of Deer Park Lodge, the ladies and I headed on down to the beach and the weather could not have been better. We were taught by Jennifer Reaburn, yogi extraordinaire and she lead us through some relaxing sun salutations and a guided meditation. Although this was the only event I was able to participate in during this weekend, from what I heard the cocktail party was a blast and everyone seemed to really be enjoying themselves. What a great way to kick back and have some much needed girl time. I don’t know about the rest of you out there but I will most definitely keep my eyes peeled for next year’s Bayfield Getaway! Hands to heart centre and ‘omm’ everybody! Hanging out with the ladies who participated in the Girl’s Getaway Weekend.